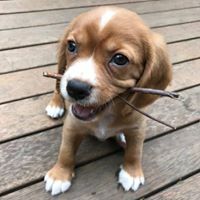 Teaching your Beaglier puppy to retrieve or “play fetch” is a great way to bond with your dog and teach them a useful trick that doubles as a fun game. Dogs naturally love to prey on things which adds another layer to the game of fetch. Dogs enjoy hunting and they see playing fetch as a substitute to hunting. 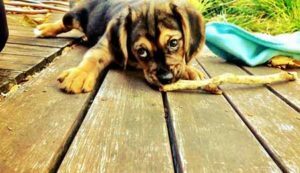 Some dogs are naturals at playing fetch while some need a little coaxing but in the end almost every dog can be taught to retrieve. Fetch starts as a fun and simple game you play. Start out with a small room where your puppy won’t be distracted. You need a squeaky toy and a treat. Throw the toy nearby (it should be within reaching distance) and your Beaglier will almost definitely pounce on it. Try and take the toy from your puppy while saying “good boy” and replace the toy with the treat. If the dog is reluctant to let go of the toy then place the treat up in front of them until they drop the toy, then praise them and give them the treat right away. Practice it for five minutes at a time a few times a day. It’s the first step towards getting your dog to fetch properly. The second step is just like the first except this time you’ll be using a cue to make your Beaglier drop the ball. Just before you take the ball or the puppy drops it say “thank you” and then immediately praise your puppy and give them the treat. This builds up an association between the words “Thank you” and the treat/dropping the ball. You’ll find that if you do this often enough there will come a point where the dog automatically drops the toy as soon as you say “thank you”, or your chosen cue word. 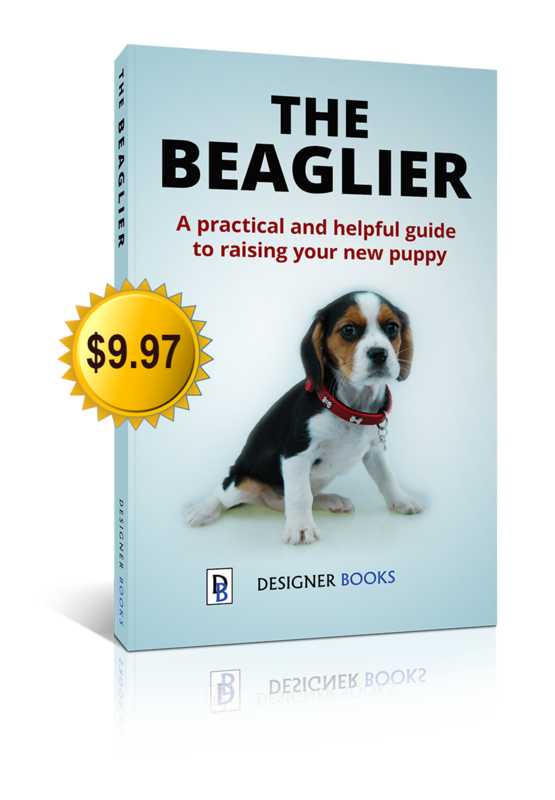 This is the basic idea behind getting your Beaglier puppy to fetch. Now you just need to build from there. With step three you increase how far away your Beaglier has to go to get the toy. Throw the toy a few metres and hopefully he will still go after it and bring it back for his treat. Carry on saying your cue word and treating your puppy when they do it right. If the dog doesn’t bring back the toy then sit and wait for them. Avoid fussing over them and instead give them the clear message that you can play only when they bring the toy back. You should keep this up and repeat the game and process. The way to build up behaviour in any Beaglier is with positive reinforcement. At this point you should also try playing fetch in different rooms and throwing the toy different distances. Remember that you should only reward your Beaglier when they actually do what you want. The final steps are to shout “fetch” before you throw the toy. 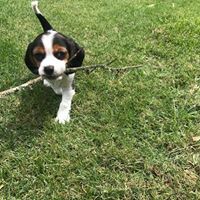 Eventually your Beaglier will associate the word “fetch” with the game and chase anything you throw after saying fetch. You should also slowly phase out treats. When the dog doesn’t need to be rewarded for doing something, then you’ve completely instilled the behaviour in them. They play the game for fun rather than for food. Congratulations, you’ve just taught your Beaglier how to fetch!! !